I’ve always been fascinated with the Himalayas, Nepal, Tibet, Buddhist culture, and hidden mountain kingdoms. Some of this curiosity is more recent (the Buddhism part), and some goes back to being a little kid watching the movie Lost Horizons (?check) with Sean Connery. In general, I love the idea that a highly spiritually and intellectually evolved culture could thrive for thousands of years, effectively unknown by those of us in the West. For the last few years, I had contemplated visiting Tibet, but the political complexities there are a little daunting for tourism. Nepal was also high on my list, but I kept thinking about that scene from Raiders of the Lost Ark where Indiana Jone’s girlfriend (Karen Allen) had to prove herself by drinking shots of some hellish liquor with a large, angry Nepalese man. Yes, I have the kind of bright mind where 35 year old movies can dictate my tourism agenda. 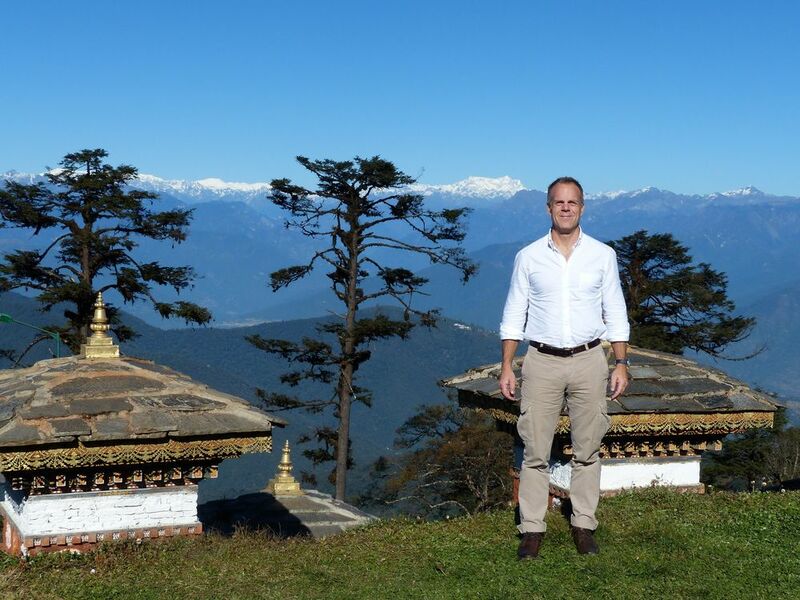 More recently, I really started to get interested in Bhutan, Land of the Thunder Dragon. Bhutan is a relatively small kingdom (country) tucked in the Himalayas. It is small at 300km across and 200km South to North. It has a population of about 700,000 with about 100,000 people in its capital city Thimphu (about the same size as Stamford, CT). It is a country that holds tightly to its traditions, until recently requiring all citizens to wear traditional garb (e.g., gho’s for men). It is the last independent kingdom where Tibetan Buddhism can thrive without restraint. Bhutan has also gained recent notoriety as the happiest country in the world, and it uses a metric it calls the Gross National Happiness as the primary measure of its prosperity (i.e., as opposed to GNP). Until two years ago, Bhutan restricted tourism to 10,000 people per year, and getting a visa was both difficult and expensive. It has recently opened up, and in 2012 it had about 100,000 tourists visit over the course of the year (I think Martha’s Vineyard gets more than this). This change in policy up meant that I can arrange a visit on relatively short notice without having to jump through too many hoops, so making this one of the two highlights of my five week trip was an obvious choice. So, no caravans for me to get to Bhutan. Rather, I would be flying Druk Air. American and Canadian tourists (you know, the ones with the flags on their backpacks) usually fly to Bhutan from Bangkok where Europeans usually fly in from New Delhi. Singapore is also an option. 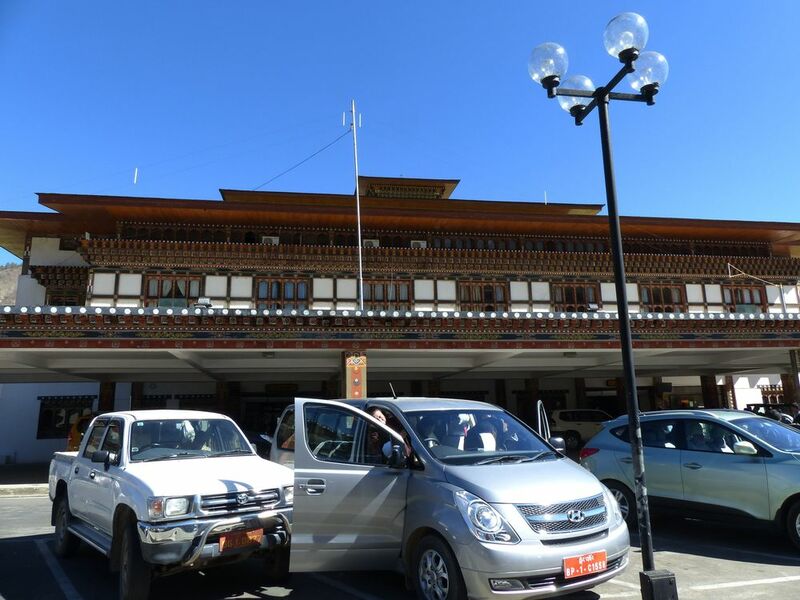 Druk, the state-owned airline, has three airplanes in its fleet, and until one month ago, it was the only commercial carrier to fly into Bhutan (a new start-up airline just joined it this month). Being the parochial kind of guy I am, I expected a 1950’s prop plane with crates of chickens inside. Instead, I got an Airbus 321 that looked just like the kind I’m used to on domestic routes with US carriers. The service was great, the food was passable, and the seats were just fine. Yet, the flight in is almost worth the trip itself with spectacular views of the Himalayas including this shot of Mount Everest from my window. I was then treated to a death-defying banking landing onto the landing strip, tucked into a tight valley. Were the windows open, I could have grabbed a pinecone from one of the trees we seemed to barely nick during our descent. 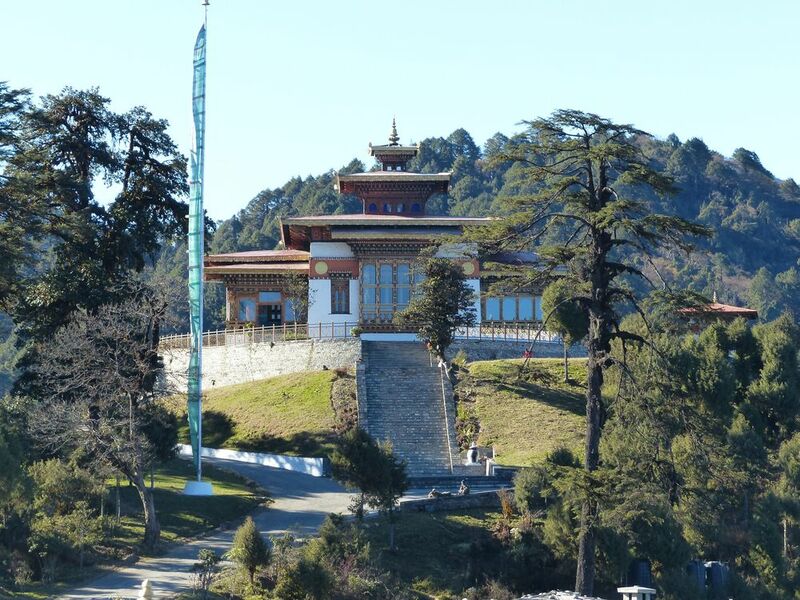 The airport, located in a smaller town, Paro (population ~25,000) was what I would have expected, traditional Bhutan building that looked a lot like a temple. From there, I was met by my Bhutanese guide who will be with me for the rest of my trip. We piled my stuff into the back of small Hyundai SUV, and off we went on a five hour drive to my first destination, Punakha. The road to Punakha is a rocky, but extraordinarily beautiful one that is the only road in the country that stretches from West to East. It’s a single lane “highway” that’s marginally paved and often quite narrow. I’ve read online that some people find the drive a little harrowing, with cars and trucks seeming to barely miss each other on tightly winding mountain turns, but I found it oddly serene. Most of the drive is climbing up and then down over a mountain pass that tops out at 3,050 meters (9K+ feet, give or take). The scenery throughout reminded me a bit of the Rockies (sharp peaks, deciduous trees, etc.) except for the landscape being dotted with beautiful temples and houses and buildings all designed to spec to the local culture. It was a long journey, starting with a 4:30 AM pickup in Bangkok and ending with my arrival at my lodge in Punakha at around 5 PM. I got a massage, had a nice meal, and was happily drifting away by 9:30 PM. Hard life.